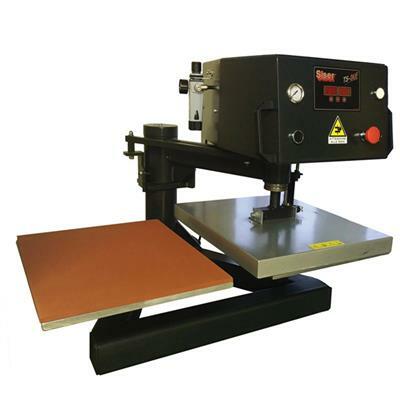 The TS DUO from Siser is an automatic heat transfer press with a pneumatic function and a double supporting plate, suitable for all kinds of applications on textiles (thermotransfer materials, plastisol, sublimatic). The upper plate opens automatically swivelling to the side ensuring operating safety. Its versatility allows the operator to print on objects with a maximum thickness of 50 mm (aluminium, ceramics…)Additional printing plates (15 x 15 cm or 15 x 38 cm) and cap sets are optional extra's. Siser TS One has a digital temperature and time display, There's also an audio alarm to alert the user for the end of the transfer time. The display also provides you with options to adjust the pressure for various applications depending on the characteristics of each material.